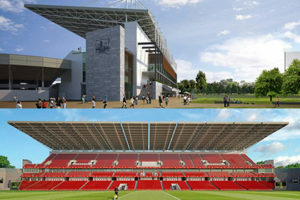 Casey Doors have been selected as the door supplier for the prestigious Pairc Ui Chaoimh Stadium project by Scott Tallon Walker Architects and Malachy Walsh & Partners Consulting Engineers. Casey Doors are to supply our Laminate Faced F-DOR range with Adjustable Steel Frames to all stands and our American White Oak Veneered F-DOR range to Premium level of the South Stand. This is the second GAA stadium where our doorsets will be installed, the first GAA stadium being Croke Park, which John Sisk & Sons were also the main contractor for. Having Croke Park as a project reference benefited us greatly in becoming the approved door supplier as our doors have been in service at Croke Park for over 20 years. This 20 year service life is testament to our internally framed F-DOR door design and verifies that our doors are fit for purpose for Pairc Ui Chaoimh stadium project.